I finally finished that Avery County history that I’ve been working on for the past couple of months. I’ve written 28,000 words since January 1. Why do I write county histories? There is a need. A few years ago, I sat down (I was working at Caldwell Community College at the time), and went through scores of counties in the Southern states. Many counties had never had a formal, organized history. (Those black heritage volumes do not count! While there can be good information in these, they are haphazard in coverage, and often contain little more than long lines of genealogy.) And for the counties that did have histories, most of them were at least 40 years old. Watauga County was one of those. Their first history was written in 1915. There was a small volume done in 1949, but nothing else. Avery County’s last history was done in 1964. Caldwell County’s were in 1930 and 1956. Yancey County has never had a history. If I remember correctly, neither has Alleghany County or Mitchell County. And those are just a few of North Carolina’s 100 counties. 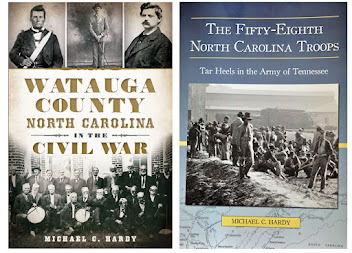 My first venture into writing county histories was the tome on Watauga County. 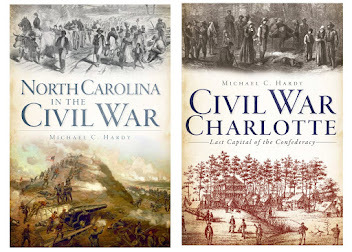 It was, more or less, a chronological history, with two chapters about the Civil War. Next came two pictorial histories, one on Avery and the second on Caldwell. The latter was released in November and is currently sold out and re-printing. This last project was a collection of essays on different local history. 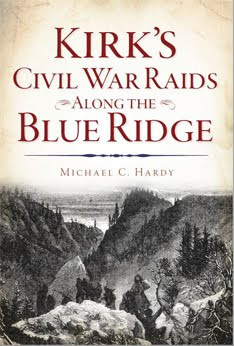 The time span for the essays runs from the 1770s (Overmountain Men) to the 1980s (Blue Ridge Parkway - Viaduct). There are two just essays about the War: one on Col. John B. Palmer (58th NCT) and the other on the Blalocks (26th NCT). The last option is to do a history topically, i.e., chapters on education, religion, military, etc. I have a county in Alabama I am thinking about writing a history for and this would be the layout if I ever get to write it. Why all this talk about county histories? The War Between the States had an effect on each of these places. Boys marched away, often to never return. And in many cases, the war was brought home by deserters, bushwackers, or whole armies. 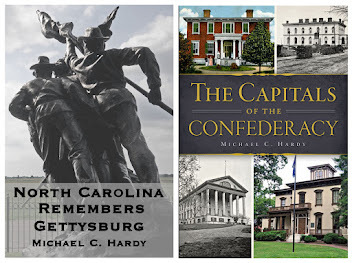 A few counties in North Carolina even have War-time histories (Yadkin, Carteret, and Davidson come to mind). Three cheers for those historians that have undertaken these ventures. The War happened almost 150 years ago and the opportunity to write about those dreadful events is quickly passing. The folks who remembered those events are gone and the folks who remember hearing those stories are quickly passing on. With today’s generations of people who just don’t read (and are largely indifferent), well, that history will soon be gone. My advice? Get out and collect at least the history of your community, and get copies of it into your local library. Maybe someday somebody like me will come along and need to use it. And, don’t forget to document where you get that information! A couple of days ago, the 183rd birthday of Stonewall Jackson came and went. Some folks are aware that the General’s second wife, Mary Anna Morrison, was born in North Carolina in 1831. She met Jackson in Virginia, not long before the war began, and they were married. Once the war began, she returned to Charlotte and continued to make the Queen city her home after his death. After the war, Mrs. Stonewall Jackson was a very prominent member of the community that sought to commemorate the war. In 1898, Mrs. Jackson organized and became the first president of Stonewall Jackson Chapter #220 of the United Daughters of the Confederacy in Charlotte. She was elected president for life. As her health permitted, she was always at Confederate Veteran reunions, and the old soldiers always enjoyed seeing her, the wife of their beloved commander. Mrs. Jackson died in 1915 and is buried beside her husband in Lexington, Virginia. In 1938, the U. D. C. marked the birthplace of Mrs. Stonewall Jackson on Derita Road in Charlotte with a large memorial arch and a bronze plaque. I have an old photograph of the arch, but have been unable to find out if it still exists. I do not wander the streets of Charlotte very often. Maybe it’s time to head to Mecklenburg County and look for that memorial. This is an article that I wrote on R. E. Lee last week that appeared in a couple of local newspapers. At the mention of "great Americans," a relatively small list of people comes to mind; George Washington, Thomas Jefferson, James Madison, Patrick Henry, Paul Revere, John C. Calhoun, Henry Clay, and Franklin D. Roosevelt are just a few. January 19 marks the 200th birthday of another individual whom many of us consider a great American. Robert Edward Lee was born in Virginia on January 19, 1807. While born into an old Virginia family, he was not born into wealth. His mother was charged with raising the family after his father, "Light Horse Harry" Lee, died in 1818. Robert’s older brother Smith had joined the Navy. Robert sought and obtained a appointment to the United States Army Military Academy at West Point. He graduated in 1829, second in his class, with no marks against his record. The summer after he graduated, his mother died. Lee went on to serve in the prestigious Engineer Corps, designing and building coastal fortifications. Lee was in North Carolina, touring Forts Macon and Caswell, in 1840. Lee married Mary Ann Custis in 1831, and they went on to have seven children. All of his sons would become soldiers. At the death of his father-in-law, Lee’s wife Mary inherited the family home at Arlington outside Washington, D. C. They also inherited the slaves from the plantation. Lee spent the next five years working toward fulfilling the requests of his father-in-law’s will, including the emancipation of the inherited slaves. In 1860, Lee found himself in Texas, serving with the Second United States Cavalry. His country was falling apart around him. Lee did not believe in secession, and he believed that the election of a man as president from a radical party did not warrant revolution. "But I can anticipate no greater calamity for the country than a dissolution of the Union." Lee wrote in January 1861. To another friend he wrote "God alone can save us from our folly, selfishness and short sightedness... we have barely escaped anarchy to be plunged into civil war." Yet, he would not take up arms against his home state. Lee resigned from the army in April 1861 and was immediately commissioned a brigadier general in the state of Virginia. His commission in the newly formed Confederate army soon followed. For four years, Lee led one of the greatest armies in history. His victories over armies at times twice as large as his own are studied and taught throughout the world. When mentioning great generals of history, like Napoleon, Alexander the Great, and McArthur, Lee’s name is always included. Many local men from the Toe River Valley served under Lee in his Army of Northern Virginia. Some of those men survived the war; others were killed on the fields of Gettysburg, Fredericksburg, Chancellorsville, and the Wilderness. Others died of disease in hospitals and prison camps. The Confederate States of America failed to gain its independence, and in April 1865, Lee surrendered at Appomattox Court House, Virginia. Lee declined several lucrative job offers after the war, only to become an educator at Washington College. He again visited North Carolina, in March 1870, spending time at the grave of his daughter Agnes, near Warrenton. Lee died in October 1870, in Lexington, Virginia, and is buried in the chapel of what is now known as Washington and Lee University. Robert E. Lee deserves to be remembered. His character, his Christian faith, his military tactics--- his entire life is an example that should be emulated. In a day and age when we need heroes, when we need people to look up to, Lee should be one of those men who command our attention. Today marks the anniversary of the start of the second battle of Fort Fisher. The first assault took place on December 24, 1864, and the fort withstood the attack. The second attack began today, and after 2 ½ days of bombardment, the fort fell to a land assault. The fort capitulated, and the last remaining harbor of the Confederacy was closed. According to the park web site, only 10 percent of the original Fort Fisher remains. I was in Wilmington this past May. I had a book signing for one of the local SCV camps. I took the family and we got to spend a few days at the beach. Fort Fisher was one of those places that we visited. I have now been to all three of the major fortifications that guarded the Cape Fear River area during the war. Fort Caswell is a third system brick masonry fort on Oak Island. It is named for Governor Caswell. I’ve been to Caswell three times; once in 1995 when I was on a ramble, once a couple of year later, with a youth group. I got to spend a week at the fort and even slept in the WWII barracks. The last time was about four years ago for a conference. Fort Anderson is an earthen fort on the site of old Brunswick town, north of Oak Island and Fort Caswell.. I visited this site during my last trip to Caswell. The earthworks at this fort are massive. Fort Anderson held out for several days after the fall of Fort Fisher. Fort Fisher is another earthen fort, this one across the Cape Fear River and below the city of Wilmington. 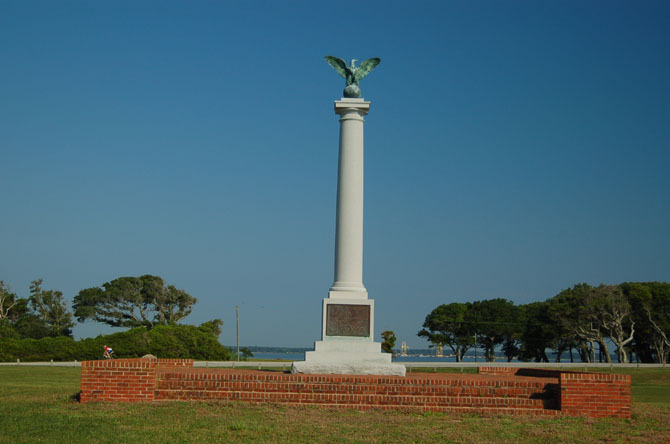 Very little of Fort Fisher remains today, but the site is marked with a monument. I like the area around Fort Fisher a lot. All park, no hotels. That is the way I like my beaches, clean. The last of the Blalocks? Why so much writing about the Blalocks? I’ll tell you why. I spend a fair number of days working (volunteering) at the Avery County History Museum in Newland. The one thing that I get asked the most about is the Blalocks. People have heard of them, they’ve read about them, they’ve read Stevens’s book about them. Maybe someone is telling folks - "Michael’s at the museum today, go ask him about the Blalocks." 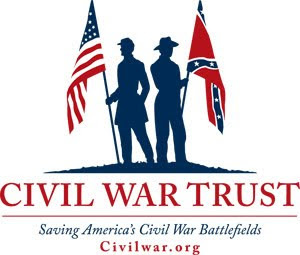 Or, maybe people see me and say, "I bet he’s a Civil War buff" (I think I passed the "Buff" stage about twenty years ago!) Regardless, I spend a great deal of time talking about the Blalocks, explaining how to get to their graves, or refuting what is in Rebels in Blue. We need to have a good book written about their lives. Unfortunately, it would not be as exciting as Steven’s Rebels in Blue. The only primary sources are found in Blalock’s pension record. His family and friends all claim that he was insane and almost an invalid (he received a pension for $72 a month at one time!). So, we have the words of an insane man. Is that good enough to base a book upon? Oh, and - when an inspector for the pension board showed up to check on Keith Blalock, the "insane man" was not there. He was in Caldwell County trout fishing, by himself. Some of you are aware of a book entitled Rebels in Blue: The Story of Keith and Malinda Blalock. Story is a good word, for this book is highly fictionalized. I’ll give two examples. One, the author cites letters written by the Blalocks to John Preston Arthur. He cites these letters as being at the William Eury Collection at Appalachian State University. These papers do not exist. Arthur died (1915, I think), and all of the papers in his hotel room in Boone (where he was living) were burned. Second example - the author writes: "Keith came face-to-face with [Harvey] Bingham’s company in late August 1862, when early in the morning, the Home Guard finally caught up with Keith. A dozen or more riders burst up to the Blalock’s cabin, the thud of hooves, the jangle of spurs, and shouts pealing across the clearing, Keith and Malinda stepped onto the porch and strait into the leveled barrels of Enfield muskets, cavalry carbines, and rifle-guns." There is quite a bit wrong with this one paragraph, found on page 53. 1. The home guard did not exist yet - created in the summer of 1863. 2. Harvey Bingham was a lieutenant in the 37th North Carolina Troops, and was wounded in the head on August 27, 1862, at the battle of Second Manassas, so he wasn’t there. 3. It most likely would have been the militia from Caldwell County chasing Blalock. 4. Arms were scarce in the Confederacy in 1862, and most of the militias and home guardsmen were lucky to have shotguns. 5. An Enfield is not a musket. Muskets are always smooth-bore, an Enfield would have been considered a "rifled-musketed," so why use the term "rifled-gun?" -- ignorance of the time period, maybe? I got to spend considerable time one day last week going over the pension applications of Keith Blalock and I have come up with a few observations. 2. He was alone when he was wounded in August 1864. He claimed to be scouting. 3. When he was wounded in January 1865, there was some rumor of his being a deserter. 4. He claimed to have never been properly enrolled as a soldier in the 26th North Carolina. Furthermore, he also claimed that neither he nor Malinda were given discharges. They were given passes back home. 5. In all of the pension application materials, there is no mention of Malinda ever serving with Keith in western North Carolina. Back a couple of years ago when I was helping Sharyn McCrumb with Ghost Riders, it was an idea we batted around about just what Malinda did after her son was born in 1863. Was she physically able to ride with Keith and was she emotionally strong enough to leave her soon with distant family members in east Tennessee, where, the war was worse than it was in western North Carolina? I hope most of you are familiar with the Blolock story. Keith was an unwilling volunteer in the 26th North Carolina. His wife Malinda, joined with him under the name of Little Sammy Blalock. There was a Samuel Blalock in the 16th North Carolina. They served for several weeks until Keith rolled around in a poison patch and got a medical discharge for the nasty rash. Malinda came clean about being a woman, and she was also discharged. They made their way back to western North Carolina, where they served as guides on an underground railway funneling escaped prisoners and dissidents out of the Piedmont and into east Tennessee. In June 1864, Keith joined the 10th Michigan Cavalry as a private, and spent the rest of the war "scouting." He got into a wee bit of trouble for shooting a man after the war, and went to Texas for a while, but returned to Mitchell (present day Avery) County to spend the rest of his life. He, and Malinda, are interred in the Montezuma Community Cemetery. Three days into the new year... The family is all gone, and the decorations are all coming down and going back into their boxes. It has been a banner year. 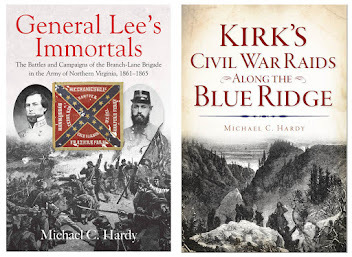 I had four books published: two about the war, and two about local history, which included material about the war. And, I had two articles in national publications. One of those articles just came out: "McClellan’s Missed Opportunity" is in the new issue of America’s Civil War. 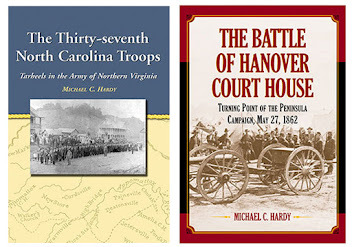 Two of my books won awards: The Battle of Hanover Court House and A Short History of Old Watauga County both won the Willie Parker Peace History Book Award from the North Carolina Society of Historians. I was not the only member of the Hardy household published this year. My darling wife Elizabeth’s first book, Milton, Spenser and the Chronicles of Narnia: Literary Sources for the C. S. Lewis Novels, was released about three weeks ago. Best of all was the birth of our daughter, Isabella Laine Hardy, on December 20, 2006. So what is in store for 2007? Another local history project, Remembering Avery County is just about finished. This is a collection of essays about local history, and will include some war materials, like essays on the Blalocks and on Grasslands, the home of Col. John B. Palmer (58th NCT). 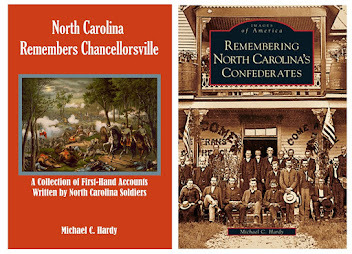 Then there is that history of the 58th North Carolina that I have been working on for several years. I have several articles accepted and awaiting publication, and have several more on the list to write. Plus, we (me, Elizabeth, Nathaniel, and Isabella) all have a lot of adjusting to do. It will take time to figure out what the new normal will be. I hope you too are looking forward to a great 2007.